Tam Cowan and his many pals delivered a feast of entertainment at Motherwell Concert Hall to raise over £20 000 toward a memorial for Phil O'Donnell. A thousand Motherwell fans sold out the venue and played their part in the fond remembrance of our late captain. Cowan immediately established a rapport with his audience with his seemingly effortless series of one liners and local references.The first half of the show was completed with the help of some memories of Phil from the fans and then the raffle prizes were drawn. A series of Motherwell legends were called into action to assist and exchange a few words with Tam.The impressive list started with Arnott and was followed by Brian Martin, Steven McGarry, Joe Wark, Mark Reynolds, Stephen Craigan, David Clarkson, Craig Paterson, Johnny Gahagan, Jim Griffin, Willie Pettigrew, Willie McSevenny, Cammy Murray, Paul Quinn and Mark Fitzpatrick.James Grady and Tommy Sheridan were also involved in picking the lucky fivers. There were lots of references to the '91 cup win and the many memories of O'Donnell which ranged from his signing for the club aged fourteen through his first appearance and cup goal to his contribution this season. The second half saw Stevie Kirk, George Burley and Mark McGhee face a range of questions; some serious and others downright cheeky.The panel coped well and showed that they were capable of holding their own when under pressure. One of the biggest cheers of the night came when Mark was asked if he would be with us next season.He explained that he could not help the rumours but said "I have no plans for anything else other than Motherwell". 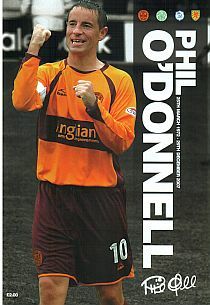 A fine programme was on sale containing pictures and memories of Phil.The volunteers from Dalziel High were kept busy selling these and the two clever Motillism posters which build up a picture with tiny text which lists of every Motherwell result. 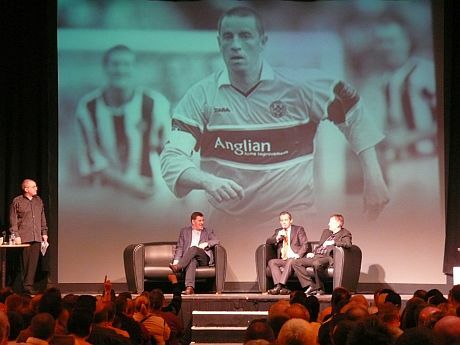 Tam closed the evening by handing over an oil painting of Phil to his family and a replica to the club.He then thanked the many sponsors and those who had donated the excellent prizes.A special mention was made to recognise the work of Phillip Speedie and David Fraser whose drive and determination made the event possible. Everyone enjoyed the evening and Tam has the thanks of the whole 'Well family for his efforts.Although there was a lot of assistance in the background his central role in raising such a huge amount for the memorial has to be recognised and he has our appreciation. The event was filmed and a DVD will be produced to add to the fund.Any programmes and posters left will also be available for sale - details will be forthcoming.